When a curious 3-week-old fawn named Snowflake made her way into a farm's hay bailer, she was lucky to make it out alive. Although the incident left her with a broken leg, it was also a blessing in disguise, because while her leg was healing at Kelly's Kritters Wildlife Rehabilitation Center in Texas, she made a new friend she otherwise would never have met. Found an Orphaned or Injured Baby Wild Animal? How to tell if baby animals are orphaned, injured, or perfectly fine—and what to do if they need your help. It's common to see baby wild animals outside during spring, as a new generation makes its way into the world. Baby wild animals might seem like they need our help, but unless the animal is truly orphaned or injured, there is no need to rescue her. 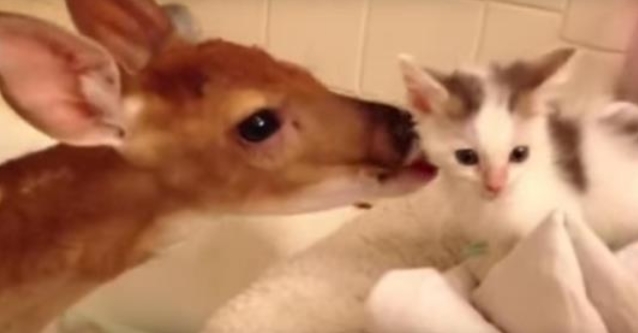 Responses to "Orphaned and injured baby deer meets a kitten at Wildlife Rehabilitation Center "